Software performance testing is an important activity to ensure quality in continuous software development environments. Current performance testing approaches are mostly based on scripting languages and frameworks where users implement, in a procedural way, the performance tests they want to issue to the system under test. However, existing solutions lack support for explicitly declaring the performance test goals and intents. Thus, while it is possible to express how to execute a performance test, its purpose and applicability context remain implicitly described. In this work, we propose a declarative domain specific language (DSL) for software performance testing and a model-driven framework that can be programmed using the mentioned language and drive the end-to-end process of executing performance tests. Users of the DSL and the framework can specify their performance intents by relying on a powerful goal-oriented language, where standard (e.g., load tests) and more advanced (e.g., stability boundary detection, and configuration tests) performance tests can be specified starting from templates. 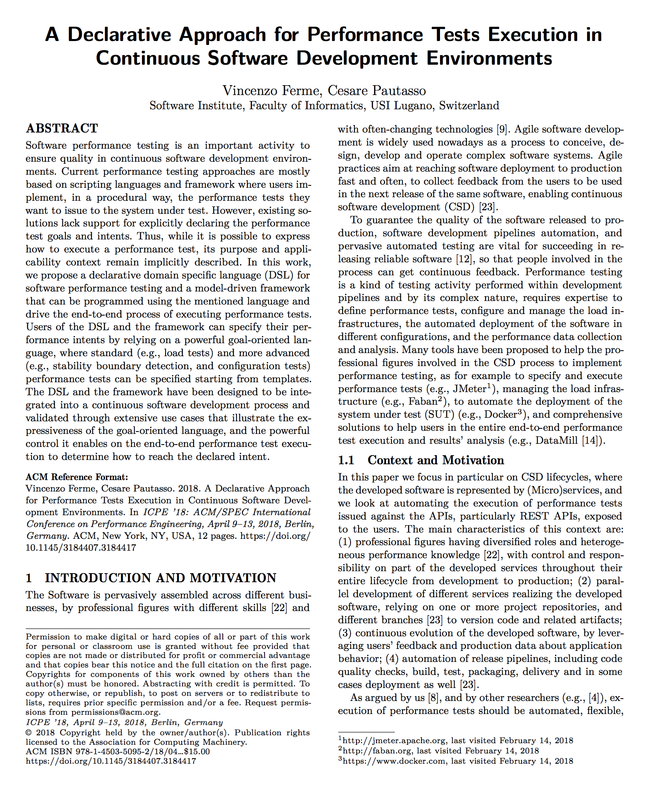 The DSL and the framework have been designed to be integrated into a continuous software development process and validated through extensive use cases that illustrate the expressiveness of the goal-oriented language, and the powerful control it enables on the end-to-end performance test execution to determine how to reach the declared intent.